Julian Cope - Jehovahkill. Vinyl LP. Bleep. Universal Music has snapped up the rights to four of the albums Julian Cope recorded for Island Records between 1987 and 1992. One of these records set for a vinyl reissue is Jehovahkill, the former Teardrop Explodes frontman’s eighth LP - and an album which, in 2006, was included in NME’s list of the 100 greatest British albums ever. 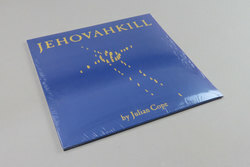 Inspired by Krautrock and Cope’s burgeoning interest in Neolithic culture, Jehovahkill is an intense and brooding listen that hangs together through the singer’s presence and songcraft. The likes of ‘Fear Loves This Place’ is comparable to what Nick Cave was doing at the time.